Western North Carolina has long had traditions rooted in agriculture. 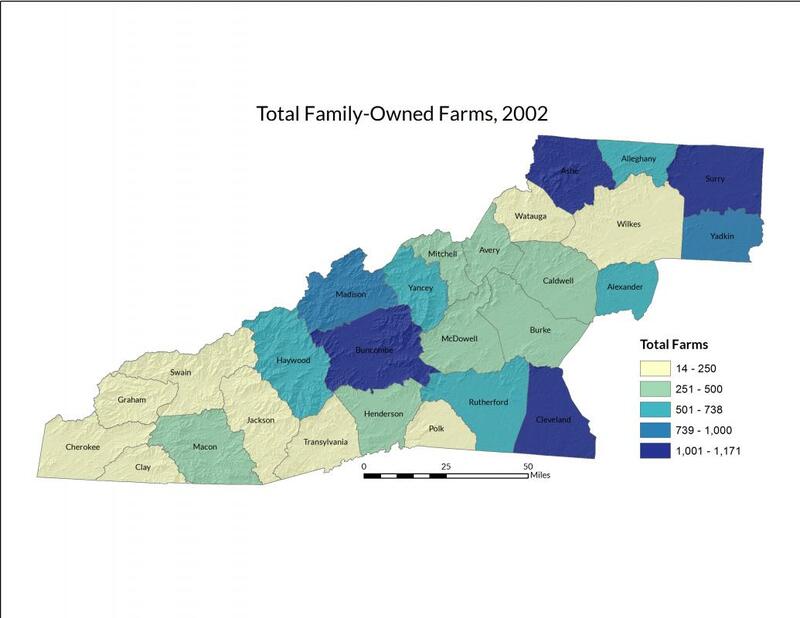 However, the total number of farms in the 27 counties of Western North Carolina has steadily declined across most of the region during the decade 2002–2012, with significant decreases seen in Yancey (28 percent), Madison (26 percent), Graham (25 percent), Haywood (25 percent), Wilkes (24 percent), and Mitchell (20 percent) counties. 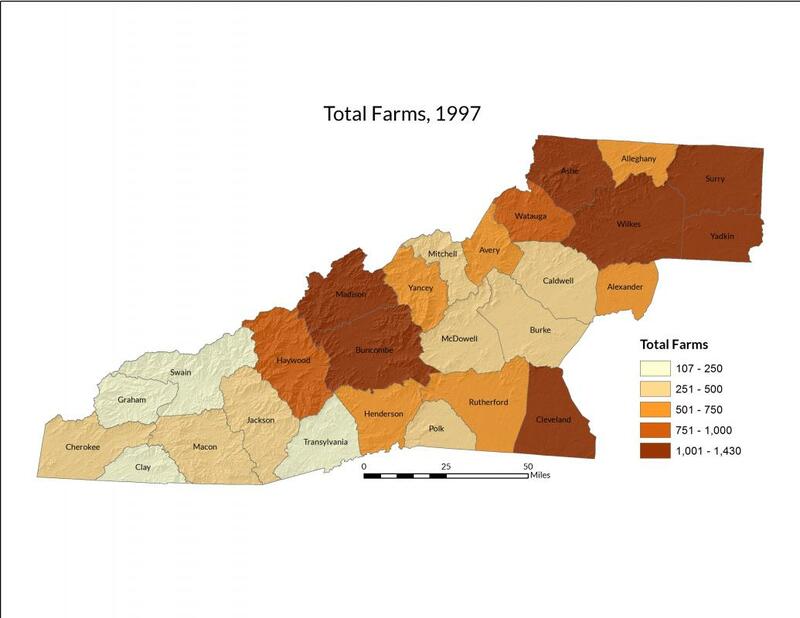 In contrast, though, the number of total farm operations remained level in Caldwell County during the same period, and five counties saw increases in the number of farms between 2002 and 2012: McDowell (18 percent), Swain (13 percent), Polk (12 percent), Burke (11 percent), and Alleghany (4 percent). 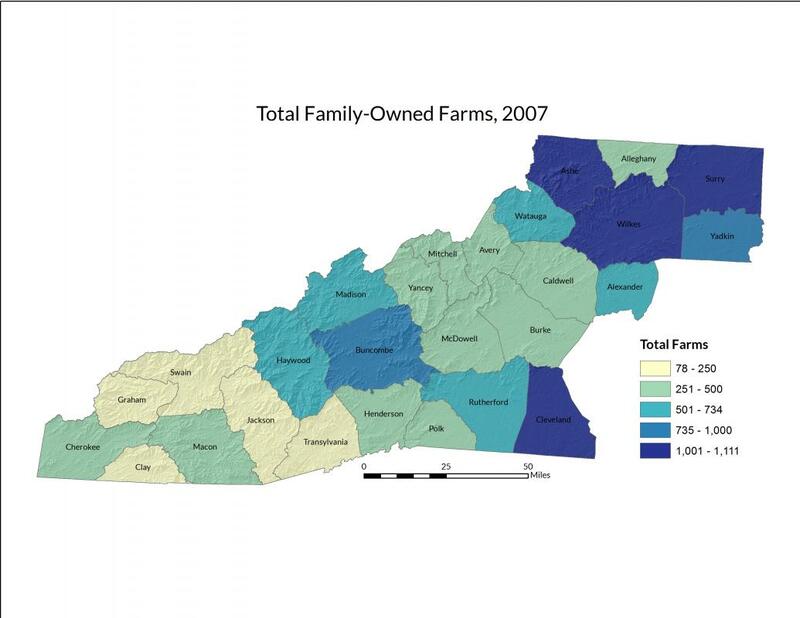 In 2012, the counties with the highest number of farms were Surry (1,256), Ashe (1,140), Buncombe (1,060), Cleveland (1,036), and Yadkin (990), while the counties with the fewest number of farms were Swain (94), Graham (107), Clay (154), Transylvania (221), and Jackson (245). Steep slopes make much of the region less suitable for large-scale farming than is found in other, less mountainous areas of the state (see Natural | Geology | Mountainside Slope). Throughout the last century, extractive industries and increasing urban and suburban development competed with mountain farmers for the use of land. 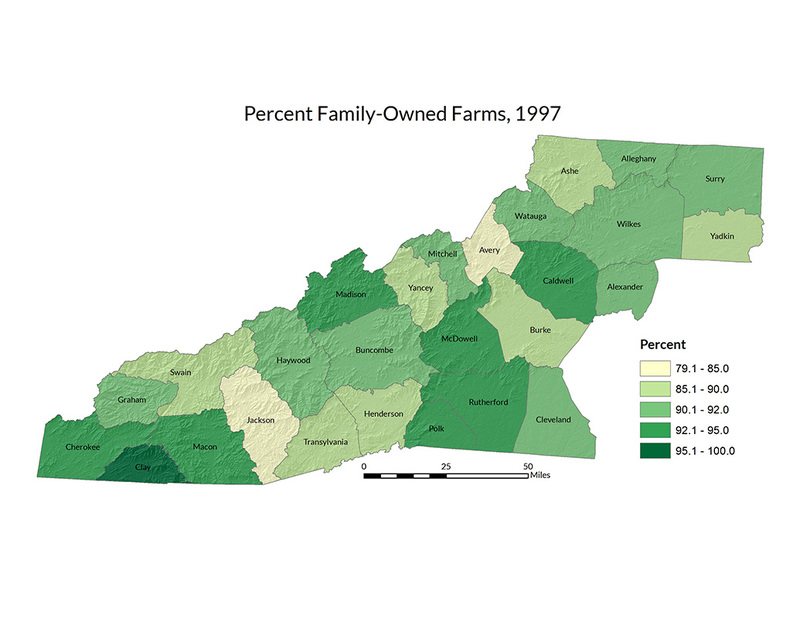 Today, the Western North Carolina region continues to experience a loss in smaller, family-owned farming operations—the region saw a five percent decline in small family farms from 2007 to 2012. 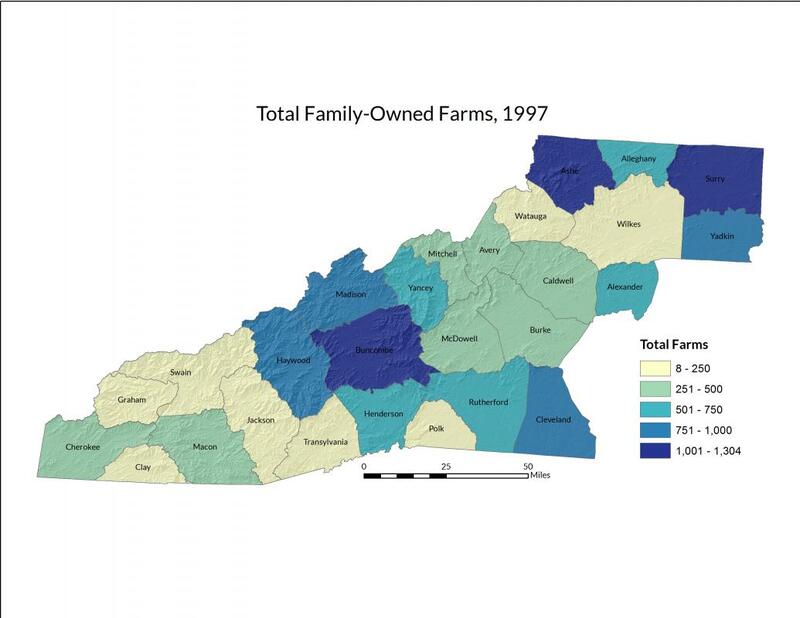 Agriculture in Western North Carolina continues to compete with other economic sectors—including industrial, commercial, and residential development—for use of available flat, suitable land. Some residents are concerned about the loss of agricultural land and its attendant cultural heritage, and have formed partnerships to enhance federal, state, and local efforts for farmland conservation and agricultural economic development. 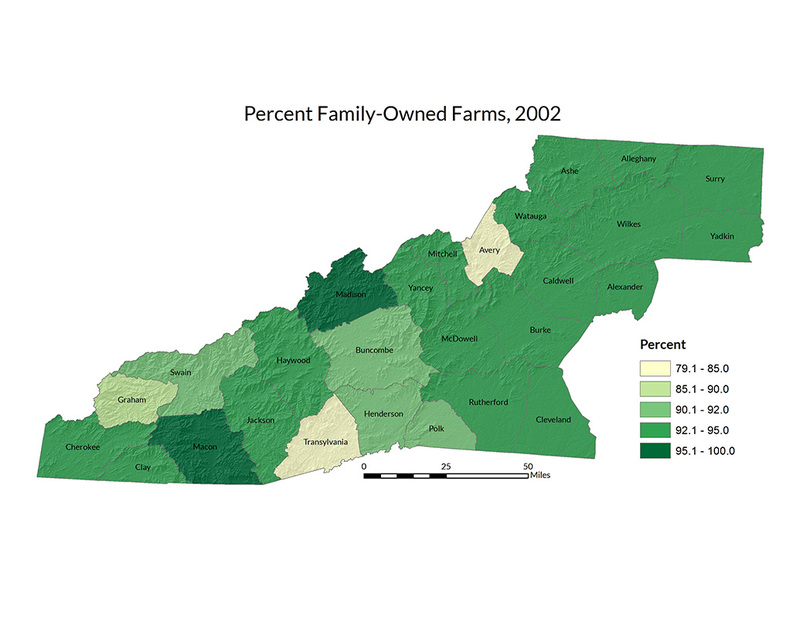 This effort has led to the protection of over 125 farms in the Western North Carolina region. When reviewing the above maps, it should be noted that data before 2002 may not be comparable with those from later years due to improvements in census coverage and survey methods, and direct comparisons between 1997 data with data from later periods should be avoided. Southern Appalachian Man and the Biosphere (SAMAB). 1996. The Southern Appalachian Assessment Summary Report. Reports 1-5. Atlanta: U.S. Department of Agriculture, Forest Service, Southern Region. Accessed from: http://www.samab.org/site/publications/. U.S. Department of Agriculture, National Agriculture Statistics Service. Census of Agriculture. Accessed September 2015 from: http://www.agcensus.usda.gov/. 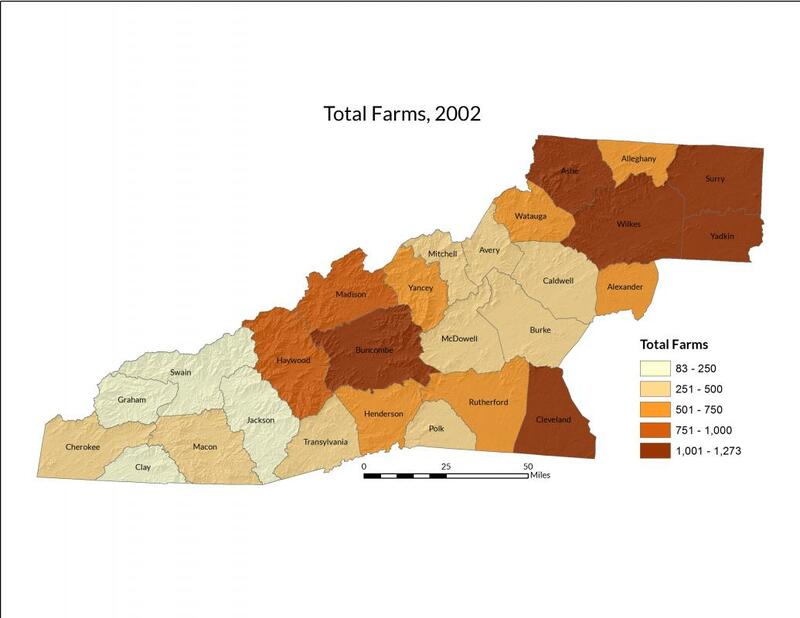 Statistics used are "total farm operations" from 1997, 2002, 2007, and 2012. Farms are defined by the U.S. Department of Agriculture as any place from which $1,000 or more of agricultural products were produced or sold, or normally would have been sold, during the year.